This spring Kings Island, the Midwest’s largest amusement park, opened The Banshee, its first new roller coaster since 2009, to rave reviews. With 4,124 feet of track and seven “mind-bending inversions,” this postmodern coaster (it looks like a giant, looping string of spaghetti frozen in mid-air) aims to thrill the pants off riders. A wonderful goal for the park that set that bar so high so long ago. We’re talking about The Beast, of course—the one-and-a-half-mile-long wooden structure that’s been raging through a wooded, 35-acre parcel deep inside Kings Island since 1979.
Credit for the ride’s long-standing success can be traced all the way back to its roots. In the late 1960s, Taft Broadcasting was a growing media conglomerate; because of federal regulations on television and radio station ownership, it was looking to diversify. Encouraged by Roy Disney (Walt’s brother), Taft execs purchased a rolling tract of land—the site of a former ammunition factory—in Warren County and opened Kings Island in 1972. Around the same time, Taft acquired Coney Island, and moved much of that park’s staff, plus some rides up to the new park. When it came time to build a new coaster at Kings Island a few years later, there were thoughts of moving or replicating other Coney rides. But in the end, says Taft Broadcasting President Dudley Taft, the desire to build “the ultimate roller coaster” is what really led to The Beast. To mark the 35th anniversary, we reached out to 13 people who have been involved over the years in all aspects of the care and feeding of The Beast—from the company brass, who first cooked up the idea, to the engineers who drew up the plans using slide rules, to the guy who re-stained the whole coaster in 1986 (“We didn’t have a clue…”). You’ve heard of the seven natural wonders of the world? If they had a list of the top man-made wonders of the world, The Beast would be on it. This is how it came to pass. Coming up with the idea is one thing. Bringing a coaster to life is another. The site’s topography presented a challenge, as did the amount of calculation that would have to be done by hand (yes, without computers). But in those more freewheeling days, it seemed almost like fun. Jeff Gramke, manager of facilities, engineering, and construction at Kings Island: Originally the idea was to try to duplicate the Shooting Star [a wooden roller coaster at Coney Island]. That was pretty much an out-and-back coaster, very similar to what we did with the Racer. [But] it just wouldn’t have fit with the topography changes that we have here; we had so little level land. So we decided to just start from scratch. The Beast was kind of the next evolution of bringing the “woodie” coasters back; everybody was looking at what to do next, and they said: “Gee! Let’s build the biggest wooden coaster.” They were kind of kicking off the coaster industry again—that’s how that evolved. Charlie Mechem, former CEO of Taft Broadcasting Company: We wanted to build the biggest, fastest, bestest coaster in the world. [Plus] there was a mystique—that probably still exists in the park business—that wooden coasters are just plain better. The wood has more flexibility, you can do more with it; the steel coasters are more rigid, the old wood coasters had a sound to them. These were all things that were sort of articles of faith in those days. In my mind, if the original great coasters were wood, and if you can build one that has the same excitement and thrill and do it in wood, you just oughta do it. There’s a nostalgia element here that I don’t think you can overlook. Dudley Taft, president of Taft Broadcasting Company: We would go around and ride all the biggest roller coasters—Cedar Point had a bunch of good ones. We all felt that the traditional wooden coaster on rails was still hard to beat even though there was the more modern technology of the metal tubes with rubber tires, which a number of the new rides featured. But, you know, it’s hard to beat the rattling of the wheels on the rails. Charles Dinn, director of construction, maintenance, and engineering at Kings Island when The Beast was built: They started it out as a normal coaster and it just kept growing and growing—lengthwise and height-wise and everything. It ballooned! Charles Dinn has historically been credited with designing The Beast. While he oversaw construction of the ride and was heavily involved in the project, the actual design was drawn up by two Kings Island staff engineers—Jeff Gramke and Al Collins. Neither Collins nor Gramke had done anything like this before. Luckily for K.I., they rose to the occasion. Charles Dinn: I was the overseer, like the CEO of the coaster; my job was to put it up. Jeff Gramke: Al Collins and I were the park surveyors, essentially, in the mid-’70s; we had done all the layout work for the park and we were doing all the design for the walkways. Taft Broadcasting wanted the biggest wood roller coaster in the world, so we went to John Allen from Philadelphia Toboggan Company, who made our Twin Racer and our kiddie coaster, and we tried to get him to design the ride. He was semi-retired and didn’t want to take on a project of that magnitude. We invited him down to the park to get him to change his mind. The last night he was in town, up in the International Restaurant, he took a menu—we still have that menu—and wrote a bunch of formulas on the back of it, handed it to Al, and said: “You guys can design the ride yourself.” The next day we looked at the formulas and they weren’t that dissimilar from what we were used to doing anyway as surveyors—railroad curves and highways and that kinda thing. Prior to talking to John we had surveyed the entire property and we did a preliminary layout down through the woods. We found out why John didn’t want to do the job; it was very labor-intensive on the calculating side! We didn’t have computers; we didn’t even have scientific calculators back then. We had slide rules and logarithm books. So we would actually have to do one math problem—primarily trigonometry—at a time, and we would have to write everything down. It took us about a year and a half total to do all the calculating, all the plans, [and] to get everything ready to build. Al would do a section and I would do a section, and then we’d switch; I would check his calculations and he would check my calculations. Charles Dinn: The engineer on staff who did most of the work was Al Collins, and of course he had his assistant, Jeff Gramke. Al was kinda laid back, really didn’t want to be in the limelight. But he was a very intelligent person. Jeff Gramke: After The Beast was built, Charlie Dinn was the guy that was talked about the most. He kind of took credit for designing The Beast when he really didn’t do it. He didn’t really come clean about that until maybe 10 years ago—unfortunately, after Al had passed away. It was a unique opportunity in the industry to work for a company that would allow you to design and build a ride in-house. It would never happen today. Almost as soon as construction began, innovations and adaptations were needed. Getting riders on and off the trains, for instance, required new technology. But the coaster’s signature became its setting, and the way it interacted with nature itself. Jeff Gramke: We were able to take advantage of the terrain and keep the overall height for the structure of the coaster very short. The tallest timber out there is only about 110 feet tall, which is very similar to what all coasters are. So even though we had a 201-foot difference from the top of the first drop to the bottom, we don’t have any structure that’s much over 100 feet [in height]. Because of the length, we were able to do some things you normally can’t do on a coaster. For instance, if you come to a curve, before you get to the next curve, we completely straightened the train out. Your body has a chance to recover before the next thing. The tunnels were kind of an afterthought; they were designed by Jim Koski, an independent engineer. We really didn’t plan to do tunnels but because of the way the topography was, it was better to go underground or dig trenches out and not have to build the whole ride 20 feet taller. At first we only enclosed the first drop tunnel and a section of the other tunnel that had to go underground. Then we wound up enclosing all the tunnels because they were such an exciting element. We [subcontracted] some of the concrete foundation work, but as far as building the ride, it was all Kings Island people. A lot of them had worked at Coney, so it was kind of a nostalgic thing that everybody got to come up here and build The Beast. Charles Dinn: I was the one that built the injection system that shot the cars out of the station so they could get more people on the ride, pick up more capacity. That’s probably one of the first ones in the country. We lined up people in two different buildings, but we couldn’t get people in the ride quick enough. People were strange. When they got off the ride, they’d have to talk about it, so that slows it down. [We had the potential] capacity of more than 4,000 [riders] an hour, but [eventually] we took one of the trains off. Bub Hazelwood was hired to work on The Beast’s construction in March 1979; he’s now a rides and maintenance worker for coasters at Kings Island:The helix—that was a challenge to build a complete, 360-degree circle out of wood. If you cut the wood small enough, use smaller pieces, it bends easier, so that’s how we did the track. The smaller pieces make for a stronger track, believe it or not. If you have a real wide board and you try to bend it sideways, it’s gonna bust. But if you take a real narrow skinny board, it’ll bend. Charlie Mechem: As you went around the helix there were a lot of g-forces on you. If I’m not mistaken, in the first version they determined that the stresses were probably not as safe as they should be so they re-engineered and rebuilt part of the helix. This is before the public rode it, to make that part of the ride safer and more sturdy. Jeff Gramke: We had more side acceleration than we thought we were gonna feel, so we changed the diameter of the helixes; we wound up making ’em bigger. We actually re-banked the curve coming out of the first tunnel overnight so the next day the ride was ready to run. Dave Focke was a control systems engineer for Aetna Electric, the company that supplied the safety system controls for The Beast. He went on to work for Kings Island for 20 years and is now an amusement park consultant: It was amazing to be walking around that ride while it was under construction. You were in awe when you walked up and down those hills and saw how the ride was carved out of the woods and how trees were preserved. David Lipnicky, public relations director for American Coaster Enthusiasts: Terrain coasters go out following the hills, the valleys, and the topography of an area of land, which means you can have breathtaking hills but you can also have longer periods of time where you’re speeding along at ground level, which gives you the illusion of going much faster than you actually are. 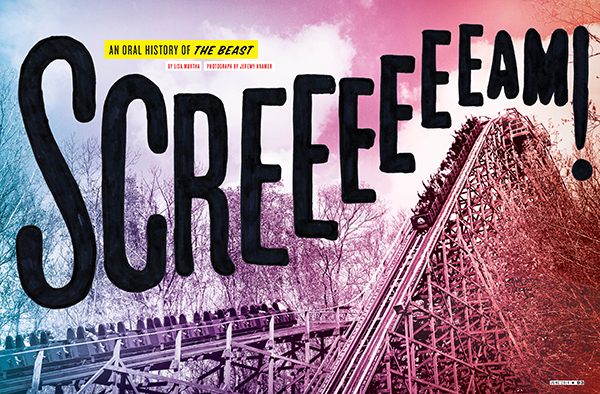 Carl Eichelman, roller coaster enthusiast; at 73, he holds the record for most rides on The Beast (he stopped counting at 4,400): When you’re on The Beast you’re not in the park, you’re out in the woods, away from all the other rides. I remember one time there was a deer out there looking at us. Where else are you going to go to an amusement park and have a deer looking at you? It was kind of weird but cool. Bub Hazelwood: There’s everything out there—turkeys, deer, fox, hawks. I’ve seen groundhogs, squirrels, raccoons. Everything you can imagine out there in the woods you see around that ride. It took 650,000 board feet of southern pine lumber, 37,500 pounds of nails, 82,480 bolts and washers, and eight months—from July 1978 until March 1979—to build the roller coaster. But it wasn’t until they were about a month from completion that they finally came up with a name for the thing. Don Helbig, public relations area manager for Kings Island and record-holder for most rides on The Racer:February 6, 1979, was when the name was announced as The Beast. Ruth Voss had my position back then. When the coaster was being built, the guys gave her daily updates on its progress. They always referred to it as “a beast of a project!” She heard that reference enough, so she went to the marketing director at the time and said: “What do you think of ‘Beast’ for the name?” It was basically a construction term, and it stuck. Jess Novak, roller coaster enthusiast from Taylor, Michigan: Ruth would ride The Beast almost every day to loosen up because she had arthritis. She always told us that it felt better from that point in the day. 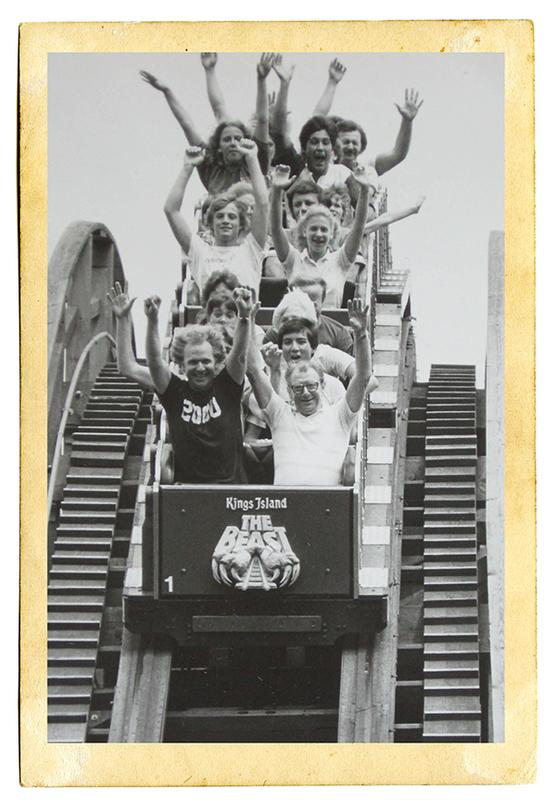 Back in 1979 when The Beast first opened, it had four seats per car, so each car held eight people. It didn’t really work well around corners that were tighter, so they reduced the trains to three seats per car. Well, they had taken one of the [original] cars that they had left over and they had made a front seat for Ruth. Literally, it is a Beast car! And they put the upholstery in there, they put a lap bar in there for her, and they called it the Ruth Voss Special. They gave it to her for her retirement. Everybody loved Ruth. Dudley Taft: We wanted to make sure everybody knew the executives were prepared to ride their own rides. Carl Eichelman: I love coasters, always have. When Kings Island announced they were going to do The Beast, I started bugging the marketing department—in fact Ruth Voss, I bet—and it was driving the park insane. They would send me letters, like: “We can’t tell you how many bolts we put in since yesterday.” And so finally I was very lucky, I got to go out to Press Day—Friday, April 13, 1979. It was cold, windy, rainy—a wonderful day! Charlie Mechem: They didn’t want the CEO to be the first rider, but I was one of the first. A couple things I remember most about that first ride: When you were going up the incline, it was seemingly endless, and of course you were going slowly and you had that wonderful click, click, click, click, click. And then you got to the apex and you paused for a moment and looked down, and at the very bottom was what looked like a hole about the size of a postage stamp. As you came down the first drop, you were going a mile a minute toward this tiny little hole! Of course you knew it was big enough, and as you got close enough it was, but then you flew into the darkness and the noise of the track and everything else was just unbelievable! It was a frightening ride—frightening in the right sense! Tearing through the woods at speeds up to almost 65 miles per hour, The Beast travels nearly one-and-a-half miles of track during its four-plus minute ride time—which is lengthy, comparatively speaking (the Vortex runs two minutes 55 seconds, and the Banshee, two minutes 40 seconds). That’s apparently long enough—especially if you ride it more than once—to evoke latent Olympic dreams, ascertain which car will do most damage to your spine, and maybe even take a little catnap. But that’s nothing compared to what the rides crew used to go through to open it for the season. Bub Hazelwood: Around the third week of March, we’ve usually got the trains on and we’re breaking ’em in for two or three weeks before we get them open to the public. When I first came here, all the maintenance guys would get in and we would all ride. We would ride very fast. A few would get out each trip and lessen the weight—the weight’s what made it go faster as the track broke in. You’d ride it till you were sick or until that train could make it by itself empty. There were times in the early days that it would not make it back into the station and we would all have to get out of the car, lean down, and everybody would push together. I was always the one that would count: “One, two, three, push!” And we’d push it up and hold it and then get in and free roll back into the station. After three or four times of that it would start making it. Nowadays that’s totally not allowed. We have plastic water-filled dummies to break [The Beast] in. And it hasn’t been stuck in quite a few years. Jess Novak: When it had skid brakes, that’s probably my fondest memories. When it rained, the brakes would get wet, the grease from the wheels would get on the brake pads, and it wouldn’t slow down as much on the trim brakes, the ones that controlled speed. I would wish for rain because those skid brakes, they’d be darn near ineffective. It was great—you’d get an unbelievable ride! John Keeter, roller coaster enthusiast from Louisville, Kentucky: The Beast has one of the best finales of any coaster anywhere, and that’s the double helix. You go through the first half of the ride and then you climb the second lift hill and you kinda think: Oh well, that isn’t that bad. And then it drops off that second lift and it’s almost pandemonium. To this day that still scares me. It took me a while to tame the Beast. The first time I saw it was on television. There was a TV show called Real People, and Byron Allen was riding The Beast and I remember he said: “If you come to Kings Island to ride The Beast make sure you wear two pairs of pants because it will scare one pair off of you.” [You] develop [a] weird fascination; you’re scared of it but also totally enamored of it at the same time. Jess Novak: I used to be a back seat rider and now I really enjoy the second-to-the-back seat. It’s pretty much all the thrills with none of the bouncing. The last seat’s pretty rough—you’re right over a wheel, so the wheel impacts up through the seat and goes through your spine and your head. The middle is really, really smooth for people who don’t want to get roughed up. Dudley Taft: I think for the first drop I’d pick the first car. That’s the most exciting. But if you really want to get into the helix, you want to be in the last car, cause you get a little bit of that effect of the train whipping that last car around. John Keeter: [One time] the girl I was sitting next to threw up. We reached the bottom of that second lift hill and I said to her: “Oh my goodness, are you gonna throw up?” She said: “Uh-huh.” And I said: “Go the other direction!” And she did. Believe it or not, after she got it out of her system she was ready to ride it again. We had to make her take a break! Jess Novak: I think I was with Don Helbig. We had gone out the night before to the Kings Island Inn across the street; we had had a few beers and we were a bit tired. The next morning I rode The Beast and I ended up falling asleep on it. They didn’t bother me for about six rides. The Beast has been re-stained in its entirety only once—in 1986, says Chris Baynum, the lucky man who got the job. Originally a part-time house painter, Baynum made a name for himself locally by painting Sunlight Pool at Coney Island in the mid-1980s. That project gave him both the confidence and experience he needed to go after The Beast. Winning that job changed the course of his life. Chris Baynum, owner, Baynum Painting, Inc.:The word got out that they were gonna paint The Beast. I spent a couple days trying to figure out how I would ever do it, I gave them a number, and they called me, said they were working up the contract. No idea how I was gonna do it! It was myself and three or four buddies—house painters. We didn’t have any skill, but we signed the agreement! We kinda did a massive hiring. It was: “High pay for high heights,” and “Meet me at the parking lot at Kings Island.” Kind of a vague ad in the paper. So people came, and we said: “Would you be able to climb up that structure?” And: “We work for $12 an hour.” And: “Are you afraid of heights?” Nowadays we have an incredible safety record, but I am so embarrassed to tell the truth: Back then we didn’t have a clue. You got $12 an hour, you got a paint brush, and you got a safety belt. Picture a belt around your waist in case you fell; you were sure to break your back! We used nearly 5,000 gallons of stain. Back then spraying was not an option; they had the Wild Safari back there, besides environmentally it’s just better not to. So we brushed that entire coaster. We had between 30 and 40 people on the job the whole time. It was my first coaster and it changed my life. Now, nationally, we are the company that paints the coasters and that’s what everybody knows us as. There are many different reasons given, but Beast aficionados almost unanimously agree that night is the best time to ride. Oh, and there’s something about the fragrance of chain lube in the morning, too. Robb Alvey, featured roller coaster expert for the Travel Channel’s Insane Coaster Wars and owner and editor of the Theme Park Review website: If you’re a virgin Beast rider, you want to make sure you take your first ride after the sun’s gone down and it’s dark. There’s a lot of rides out there that use a lot of lighting, a lot of effects. There’s almost none of that on The Beast. If you’re on one of those nights where there’s not a lot of moonlight, it’s just pitch black going through those woods; if you’ve never ridden the coaster before, you have absolutely no idea which way it’s gonna go next. Most rides, like Vortex, you can see exactly what it does. You have absolutely no clue what The Beast is gonna do, [and] darkness just sort of adds to the mystery. Carl Eichelman: At night, people would be stamping their feet in the station, chanting: “Beast! Beast! Beast!” I had one friend from Rochester, when she visited she would start the chant every night. Then everybody would just carry it on until the ride shut down at 10 o’clock. It’s noisy, too, inside that building with everybody standing there. John Keeter: Night rides—that’s what The Beast is all about. There’s a feeling that you can’t get during the day. At night it almost feels like it comes alive—it speeds up or something. It’s probably just a mental thing. When I worked on it, late at night was when The Beast got the most crowded. There were some times on weekends that we would stay there way past park close, ’cause they were still running out the lines on The Beast. Jess Novak: There’s a brake shed about midway through the coaster that controls some of the speed. At night, if the train was close to empty, the mechanics would go out there, and they would lower the brakes—when they were the old style—so the train wouldn’t go too slow and get stuck in a valley. If you were lucky the ride operator would signal the mechanics and you’d be on a light train. Oh, it was just unbelievable; we would just go through there so fast! The other thing that’s wonderful is the chain lube they use in the Cincinnati humidity. The Beast seems to be particularly fragrant. You know the old saying, “I love the smell of napalm in the morning” from Apocalypse Now? I love the smell of chain lube in the morning. Thirty-five years later, The Beast’s creators, builders, and caretakers look back on their accomplishments with pride. Constructed at the dawn of the era of corkscrews, loops, inversions, hanging train cars, and sound-barrier-breaking speeds, a wooden coaster that still excites and terrorizes riders of all ages is a rare commodity—one that Kings Island has worked hard to maintain. And although it is simply a theme park ride at its core, The Beast has evolved into so much more for so many people: a talisman that allows them to fulfill dreams, conquer fears, set records, and wonder at the sheer power, if only for four minutes, of an engineering marvel designed and built by mere human hands. John Keeter: To me, The Beast is one of those iconic things that will forever be tied to Cincinnati. Years later, as an adult, I was working full-time and I still loved Kings Island so much that I actually got a job working part-time at the park. I eventually got to operate The Beast. That’s what I had always wanted to do—it was on my bucket list. I guess you could say there for a while I kinda gave back to it; I kinda became one of The Beast’s caretakers. It’s fun but it’s a lot of work, some of the most physical labor I ever did. Bub Hazelwood: Just to have the power, the speed of that thing in your hand is pretty amazing. Robb Alvey: People claim that they’ve slowed it down a little bit. The die-hard coaster people will tell you: “Oh, it’s not as good as it used to be.” I don’t think they’re right. It’s as good today as it was 30 years ago. We’ve done rides on it where the brakes are turned off and it does feel a little bit more tense, but you have to find that great balance between making a good ride and making a good ride that is maintainable over the years. There are very few rides out there you can look at 35 years later and say: Number one, it still gets huge lines. And number two, people still come off raving about it. The last time I rode it—we did night rides in 2011 or 2012—that thing still ran like a bat out of hell. Carl Eichelman: I have ridden the Beast 4,400 times. I should try for 44 more so I could get 4,444! I started counting on my first ride and then I kept counting right up until about 1985. I had to switch to day shift then anyway—so I really didn’t have the time to go out and do those kinds of rides that I used to do. But The Beast never got boring. It never did. Correction: This story originally stated that The Racer was among the rides that were brought from Coney Island to Kings Island. That was incorrect. According to Don Helbig, PR area manager for Kings Island, it’s a common misconception, but The Racer was in fact constructed entirely at Kings Island and completed in 1971. We apologize for the error.